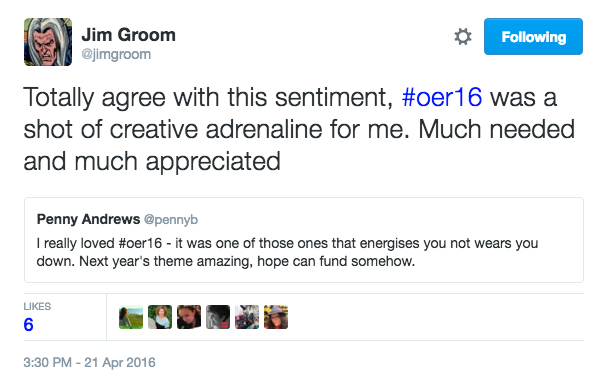 OER16: Open Culture – that was the conference that was. 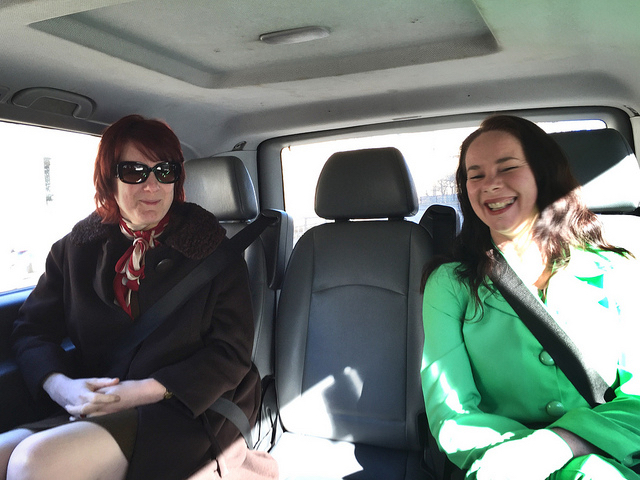 So, the OER16 Open Culture Conference has been and gone and what an experience it was! Co-chairing OER16 with my inspiring colleague Melissa Highton has been an enormously rewarding experience and I owe a huge debt of thanks to everyone who volunteered their time, effort and creativity to make the conference such a success. In particular I’d like to thank our keynotes, Catherine Cronin, Emma Smith, John Scally, Jim Groom and Melissa Highton for their inspiring and thought provoking talks and, of course, the ALT team for supporting the conference and ensuring everything ran like clockwork. I can highly recommend charing an ALT conference if you’re ever thinking about it! It’s too soon after the event for me to gather my thoughts and attempt to provide any kind of coherent overview so here’s a round up of the conference outputs and some of my personal highlights in lieu of something more considered. OER16 Open Culture: oer16.oerconf.org, the conference blog with links to programme, presentations, livestreams, etc. ALT youtube channel: www.youtube.com/user/ClipsFromALT, videos of welcome, introductions, keynotes and sessions. Radio EDUtalk: www.edutalk.info/category/oer16/, interviews with conference participants and audio from keynotes. Francesbell’s Blog: francesbell.wordpress.com/tag/oer16/, a wonderful series of reflective posts from blogger Frances Bell. Open is messy but that’s okay: blog.digis.im/conferences/open-is-messy-thats-ok-oer16/, a lovely blog post from Simon Thomson. Wikimedia UK: wikimedia.org.uk/wiki/Open_Educational_Resources_conference, round up of Wikimedia UK’s activities at OER16. OER16: Empowered Openness: marendeepwell.wordpress.com/2016/04/21/oer16/, reflections from ALT’s Maren Deepwell. Martin Hawksey’s TAGSExplorer for OER16. So now it’s time to pass the torch over to the fabulous Josie Fraser and Alek Tarkowski, two of my favourite people working in open education today, who’ll be co-chairing OER17: The Politics of Open. It’ll be awesome! 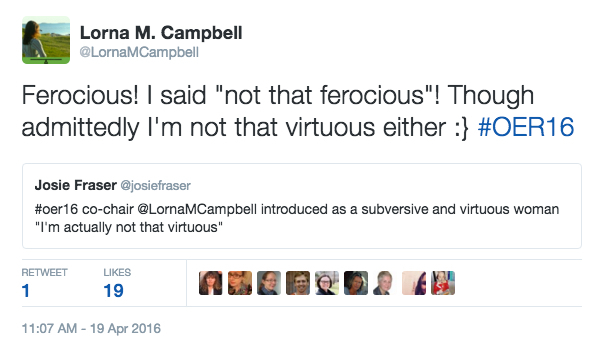 This entry was posted in oer, openscot, Women in Tech and tagged oer, oer16, open, OpenEdFeed, openscot. Bookmark the permalink. Sounds like you had a really productive & useful time. I did my best to keep up with the prolific tweets!